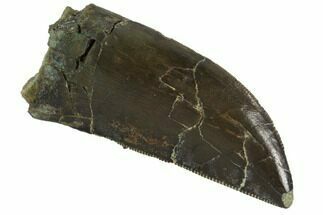 was a theropod of the Late Jurassic that lived from 156 to 145 million years ago. 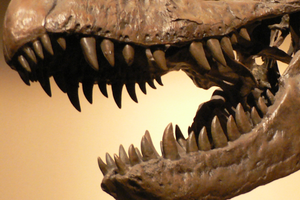 It was a predator with a massive skull, serrated teeth, and gaping jaws. Allosaurus had brow horns which appear to have varied somewhat in shape between individuals. This powerful and plentiful carnivore genus could grow more than 30 feet long. Allosaurus tail was long and muscular, the neck was short, and the skull was very large. The neck had nine vertebrae. 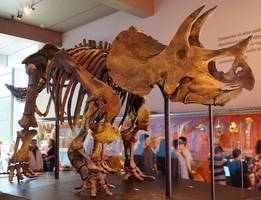 The number of tail vertebrae may have varied with size. Different estimations suggest there were less than 45 tail vertebrae, and as many as 50. Allosaurus had 14 back vertebrae and 5 sacral vertebrae. Vertebrae of the neck and at the anterior of the back contained hollow spaces, which like modern birds, may have been air sacs that were part of the respiratory system. first recorded discovery of an Allosaurus fossil was in 1869, likely retrieved from Morrison Formation strata near Granby, CO. Leidy received the piece of tail vertebrae from F.V. Hayden who acquired the fossil secondhand. 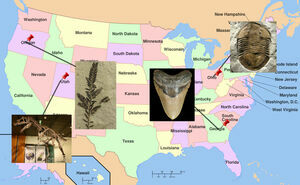 The fossil was first assigned to a European genus, but Leidy eventually assigned it to Antrodemus. In 1877, O.C. Marsh named Allosaurus fragilis. The Greek meaning of Allosaurus is ’different lizard.’ The vertebral fragments from the collection which Marsh studied had features which made the vertebrae lighter, hence the epithet, ‘fragilis’. 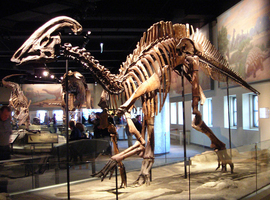 Marsh continued to competitively collect and name theropod specimens, as did his rival E.D. Cope. In 1920, C.W. Gilmore asserted that Leidy’s Antrodemus vertebrae appeared the same as Allosaurus, therefore Antrodemus should be the accepted name. 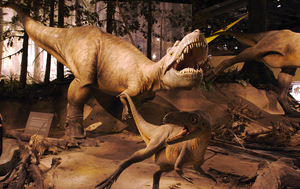 Madsen published his argument that Antrodemus was inadequately identified and named, and that Allosaurus should be the name used.